of the Rotary Club of Berwick. Sponsorship opportunities exist for companies wishing to get exposure in the local community while respecting the Rotary brand and supporting the values of Rotary. Exclusivity. Only one business of the same industry as Platinum and Gold sponsors is accepted into the program. In addition, the structure of sponsorship categories clearly differentiate sponsors. Exposure. Sponsors receive ample exposure at the designated events, according to the sponsorship level chosen. Exposure includes branding (logos, banners) display, product showcasing, acknowledgement at events, hospitality and opportunities for direct contact with the public. Exposure is measured by the number of people that the sponsor has the potential to reach at a given event. Corporate Social Responsibility. Platinum and Gold sponsors contribute to The Rotary Foundation, the charitable arm of Rotary which addresses challenges such as poverty, illiteracy and malnutrition with sustainable solutions that leave a lasting impact, such as eradicating polio and promoting peace. 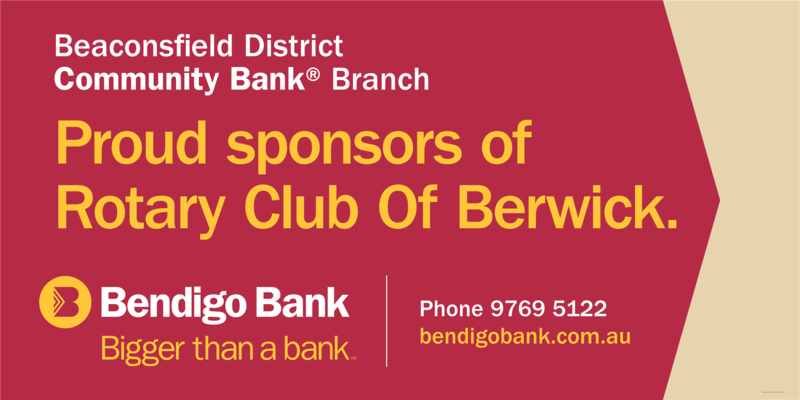 Sponsors can also choose to direct a component of the sponsorship to local causes with the previous agreement of the Rotary Club of Berwick. This allows sponsors to publicly express their support for The Rotary Foundation or local programs as a way to fulfilling its corporate social responsibilities. For more information download our SPONSORSHIP BROCHURE.